Carpet Cleaning Sacramento, CA | Why Van's Chem-Dry? See why Van's Chem-Dry is the natural choice for cleaner carpets. What Sets Van’s Chem-Dry Apart From the Rest? Van’s Chem-Dry takes pride in providing quality cleaning that is safe & healthy for your home & family. With each job we take on, we are always fair and practical, treating you and your home with respect and care. You can rest assured that you are working with a trustworthy company that will do its best to exceed your expectations. We know that not all carpet cleaning companies are created equal. You’ve landed on our website for a reason; you’re looking for the top quality carpet cleaning company in Sacramento. Let us tell you why you should choose Van’s Chem-Dry for all of your carpet, tile, rug, and upholstery cleaning needs. We stick to a set of core values that guide our thinking and determine our decisions. These values help us accomplish our mission of providing the best possible service to every customer. Our values are summarized in 5 reasons why to choose Van’s Chem-Dry throughout Sacramento & Elk Grove, CA. It’s easy to see the value of our services when you compare them with other carpet and upholstery cleaning services in Sacramento and the surrounding areas. Van’s Chem-Dry is known for quality home cleaning services at a great value. We have been providing superior cleaning service to the Sacramento Area & The Elk Grove Area while the Chem-Dry brand has been the leader in the industry for more than three decades. 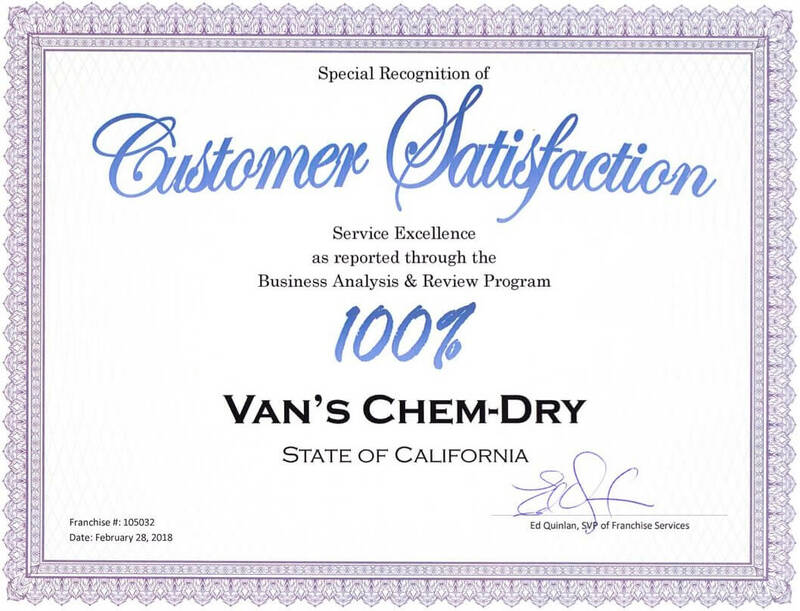 As the largest carpet cleaning company in the area, Van’s Chem-Dry is dedicated to the highest level of quality service. We combine the brand trust of a national system with local service. After all, we live in Sacramento too, so we’re just as interested in providing quality service as keeping the environment clean and protected. Van’s Chem-Dry is experienced in servicing a variety of types of fabric, providing the appropriate care for even the finest carpets, rugs and upholstery. We take ongoing opportunities to gain new experiences, add services and improve our tools as we always strive to stay on top of our industry. Call us at (916) 641-0144 in Sacramento or (916) 685-5856 in Elk Grove to speak with one of our professional staff members. Van’s Chem-Dry believes in educating both our staff and our customers. By educating our Chem-Dry staff through annual training and required certification, we stay on the cutting edge of the carpet cleaning industry. By educating our customers, they become more knowledgeable about cleaning and caring for their floors, rugs, and upholstery. This way our customers make better decisions, resulting in a better overall experience with our service and longer lasting carpet investments. Van’s Chem-Dry will delight our customers with the cleanest and fastest drying carpets and upholstery in the industry. Our products will be expertly applied so as to be gentle on carpets and property, safe for people and pets, and our services will be delivered by trustworthy, friendly professionals. Looking for a reliable carpet cleaning service outside of Sacramento or the Elk Grove area? We also recommend several great Chem-Dry locations for superior carpet cleaning in Los Angeles, San Fernando Valley, Fresno, Virginia Beach, Detroit, Rochester, Yorktown, Greensboro and Bellingham, WA. If you have friends or family in need of carpet cleaning in these areas, feel free to let them know about the amazing services that are available with their local Chem-Dry! Trust the Chem-Dry experts. We’re at the top of our industry for a reason!